We have had cabinet door samples sitting in our house for about two months. I haven't even thought to take some photos to share until this weekend. The white maple for the perimeter cabinets and the dark will be on the island only. I decided to do the mixed look. We also added the upgraded glaze on the cabinets. It's an heirloom glaze. It will make the moldings on the cabinets pop and also make the white cabinets not so bright white. I think it really adds to the look we are going for in the kitchen. Don't they look even more beautiful up against the orangey oak in our rental? 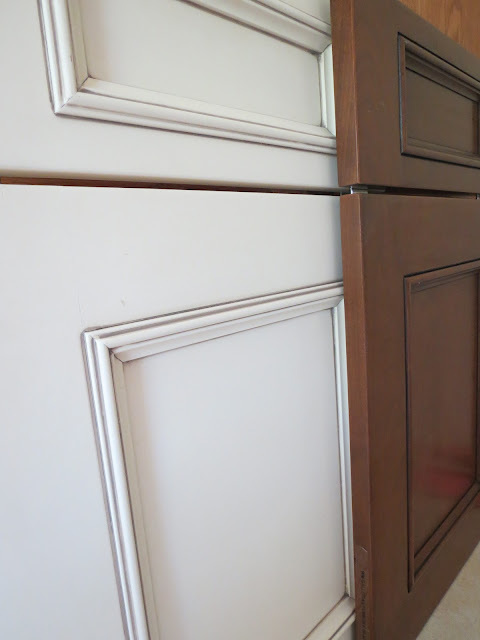 The actual cabinet doors shown above are a little different than the door style than what we ended up with. But similar. Next up, countertops. My favorite thing to pick out. Can you tell what kind of material this is by looking at it? I always thought granite was the most beautiful countertop of them all. I remember when my parents upgraded their laminate countertops and they brought in the pretty slabs of granite. So when we were looking at samples, I pushed for granite. Well, really first I pushed for concrete countertops but everyone and their mother (even mine) told me that it was probably not the best choice....anyway, then I pushed for granite. While browsing countertop samples I picked this one. Wrong. It's quartz. Cambria Quartz countertops are actually stronger than granite and is still a natural stone. No sealing or regular maintenance needed because it is nonporous. The ship date for our cabinets is the last week of August. After those are installed they can remeasure and we will give the final okay to have them cut the countertops, those will be delivered a few weeks later. Hopefully when those babies come in it will also be move in time. September is our goal! What is your favorite kind of countertop? Do you like the mixing of wood tones? Does looking at the photo of my chipped nail polish make you want to give yourself a mani too? I love those white cabinets and that stone you picked for the countertops - your kitchen is going to be gorgeous! Thank you Melanie! You are so sweet! I love how the flecks in the counter top pick up both colours of cabinets! me too, it was a perfect match! We looked at quartz too! But we ended up with granite, because we found a heck of a deal. It's going to be beeeeeautiful! We are going with quartz countertops too (ours should be here soon!!). And a mix of dark and light cabinets. Clearly this means that we both have impeccable taste :). Ahhh I'm in love with the quartz and the glazing will be perfect! I love that you're doing your island a darker stain too. Your kitchen is going to be SOOO beautiful! I have quartz countertops too and they are awesome! Ooooooooooo, pretty. I like the glaze. Nate was anti-glaze so I'll live vicariously through you. We looked hard at Quartz but granite ended up being less expensive. Can't wait to see your kitchen come together!! Adam was anti-glaze too. He still would've rather bought a gold cart! I love all your choices. As you know, I love that you are using two different finishes. I too love the glaze on the fronts of the cabinets. Just a nice extra touch. I noticed that you changed the pictures on the top of the blog. I like the way Scout is looking into the new house. Too cute. I am very proud of you and Adam. Love you, Aunt Mo and Uncle Frank. I love the mixed tones for the island and cabinets! I want to do that in our kitchen when we can afford such things. :P And the quartz is really pretty, too! Quartz is considered harder than granite, but the good thing about the latter is that granite stones are easier to clean (you just need mild detergent and warm water) and are less prone to bacteria. As for the cabinet doors, though it would be nice if you have just one color for all the cabinets, mixing two contrasting colors would also create a sense of diversity in the room. Besides granite, other option includes natural stone like marble, limestone and soapstone. These are softer than granite and should be used with extra care. Oh, I LOVE your quartz! Which Cambria color is it? This is exactly what I'm looking for. We have a kind of creamy backsplash and I think this would work well. HI Heather, I believe it's windmere by Cambria!